Lambert William Harris's son Lambert Thomas had suffered for a number years from respiratory problems. 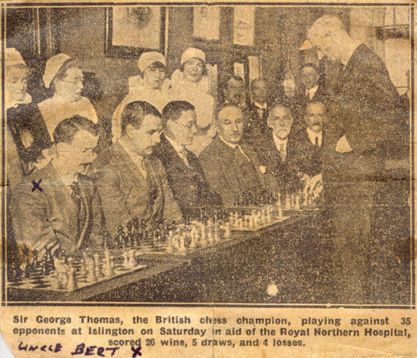 He never married and worked in his father's shop as a piano tuner and was a very keen chess player entering many tournaments as seen in the newspaper report. 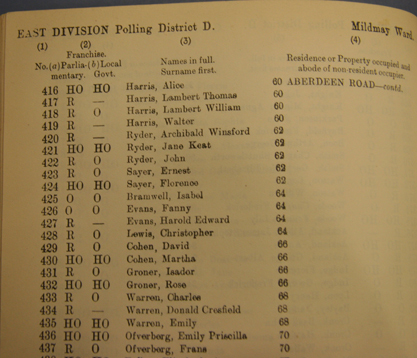 The electoral register from 1929 shows the occupants of 60 Aberdeen Road Highbury. They are Alice Harris, her husband Lambert William, and their sons Lambert Thomas Harris and Walter Harris. Below is Lambert Thomas Harris and his mother Alice outside the family shop in the mid 1920's. After a short illness Lambert Thomas Harris died on Saturday 11th January 1930. His nephew Herbert Harris then aged 15 worked in his grandfather's shop on Saturdays, and remembered hearing the sad news of his uncle's death.